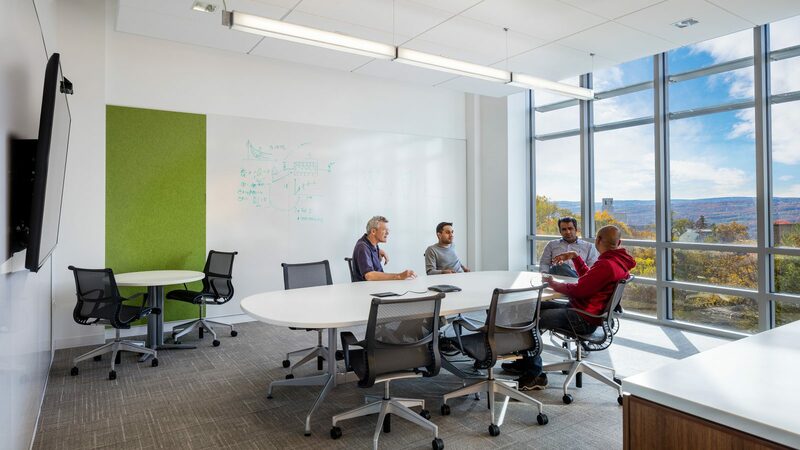 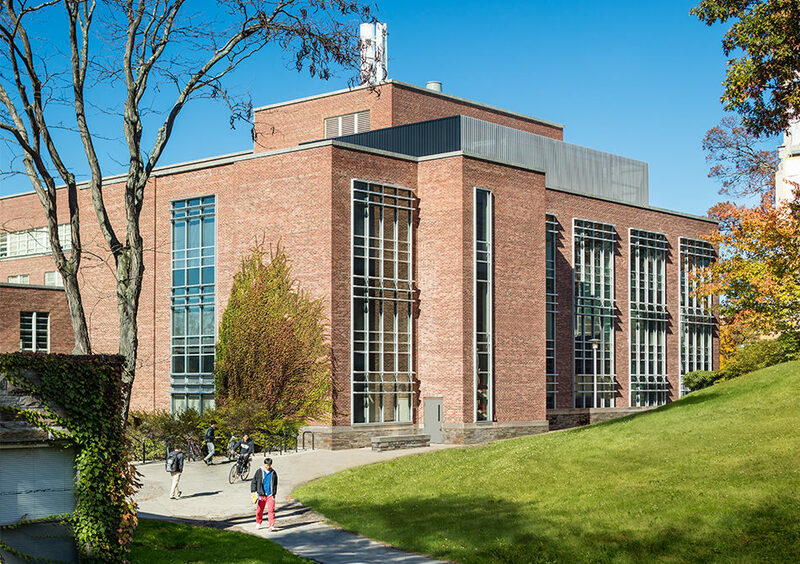 Cornell’s College of Engineering sought a prototype renovation that would demonstrate the potential of its mid-century teaching labs to meet the next generation of interdisciplinary research needs. 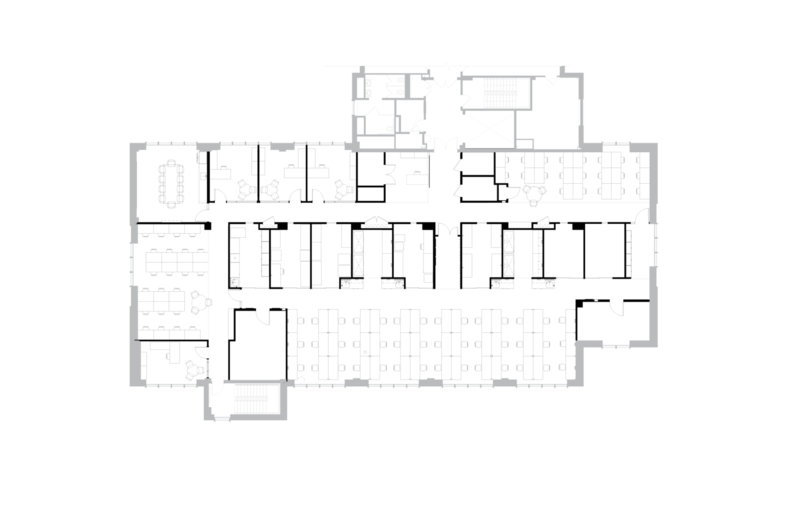 Originally built in 1952 with an open plan, Kimball Hall had been compartmentalized over the years into a series of small, isolated rooms, largely devoid of natural light. 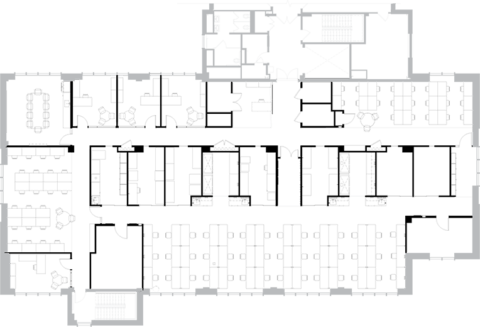 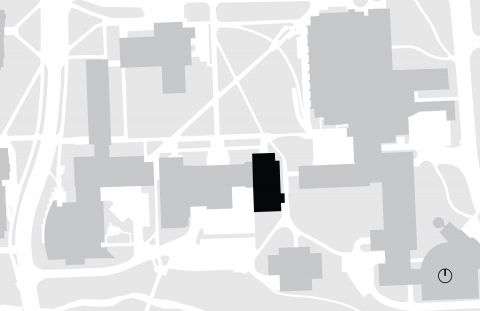 This layout discouraged interaction among faculty and students of the College’s dozen-plus programs, and it failed to accommodate new occupants and research types. 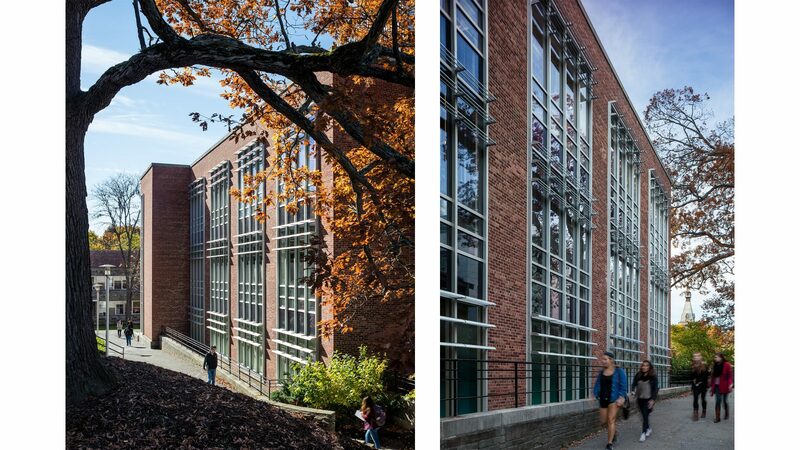 Kimball Hall Wins S-Lab Award! 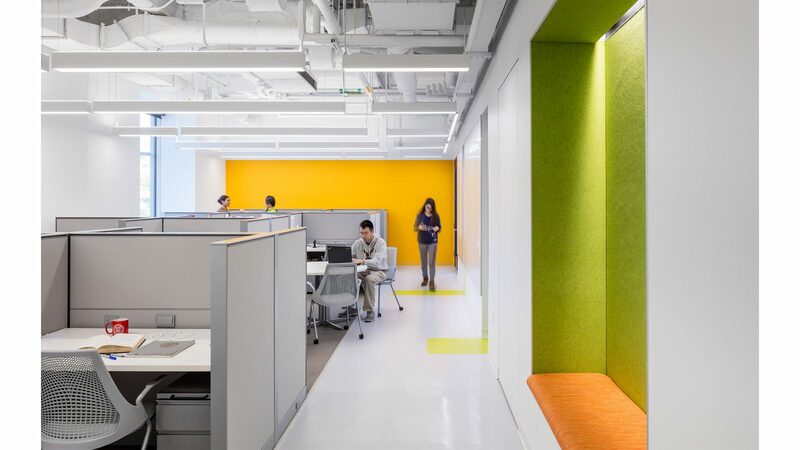 The renovation creates an open, flexible suite of visually connected spaces to accommodate a wide range of disciplinary needs. 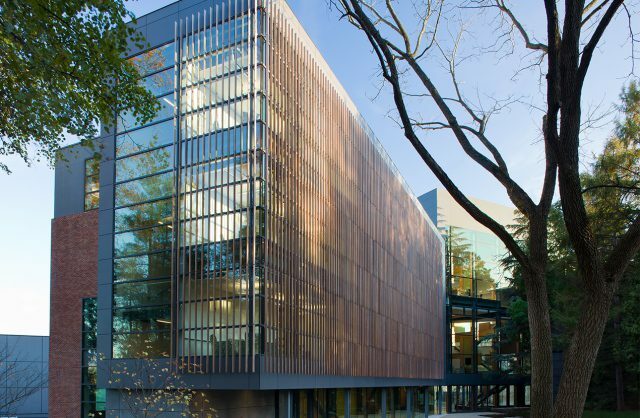 It weaves together layered work areas, distinguished by their levels of energy use. 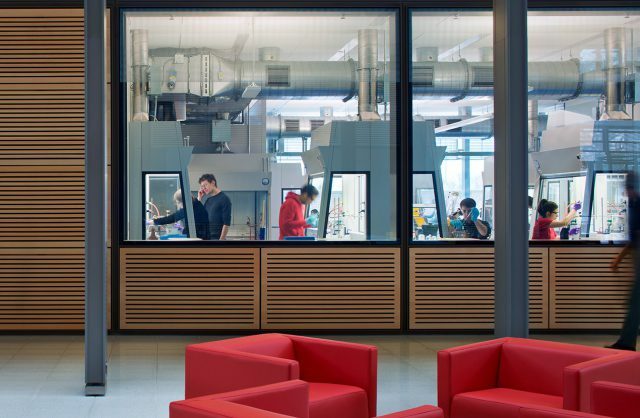 Energy-intensive, specialized spaces supporting an open, flexible research lab combine with low energy use offices and student workspaces to form an integrated and cohesive research neighborhood. 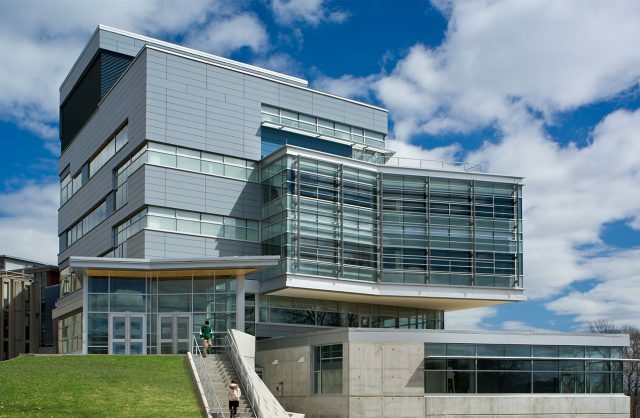 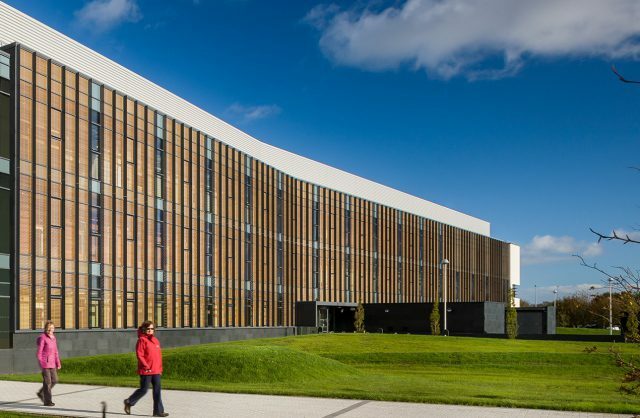 The design encourages collaboration and provides opportunities for new scientific relationships among the engineering departments. 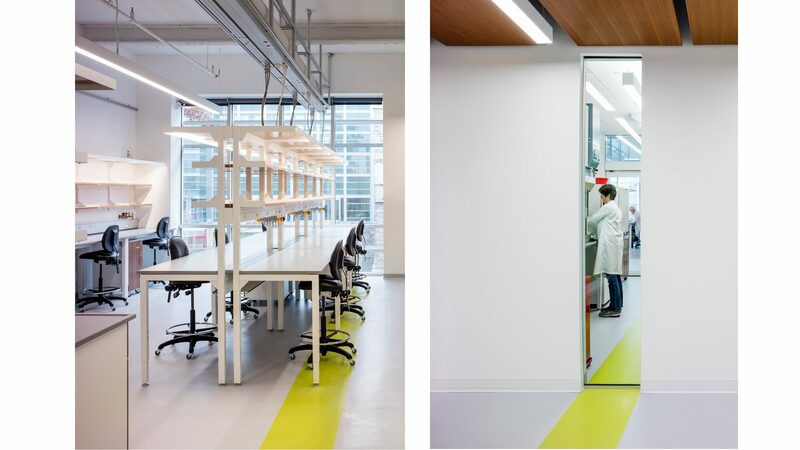 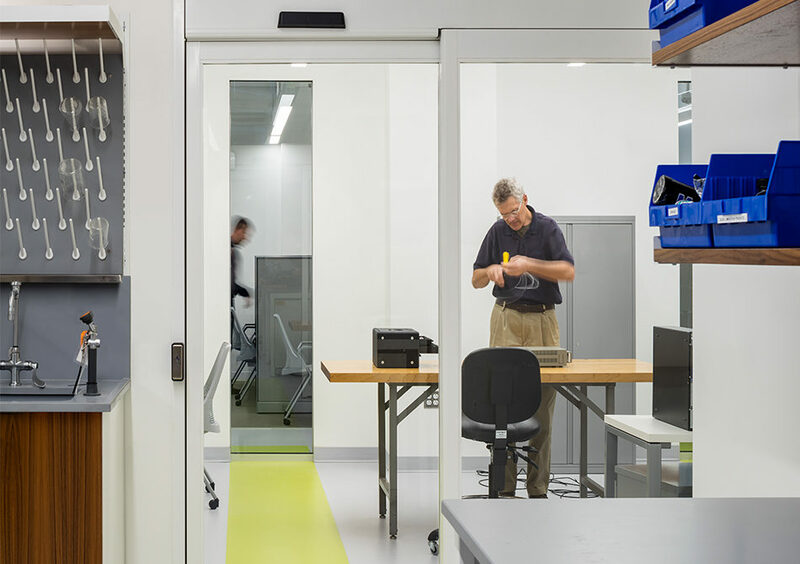 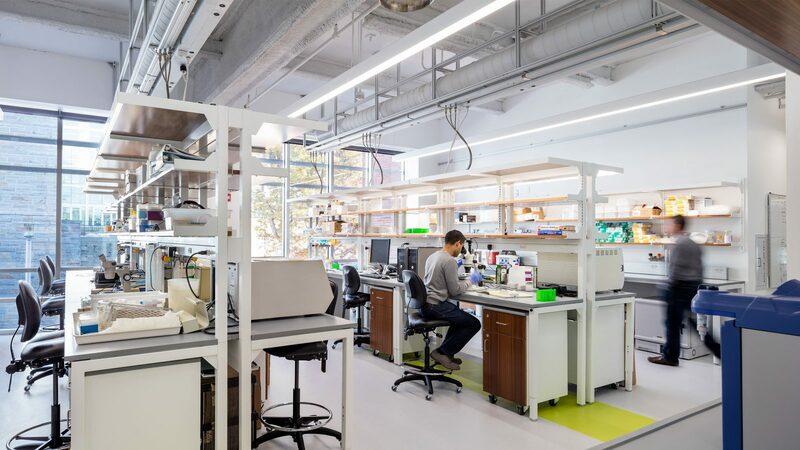 Taking advantage of the building’s long structural spans, the open lab features a simple, adaptable infrastructure system that can accommodate a range of uses. 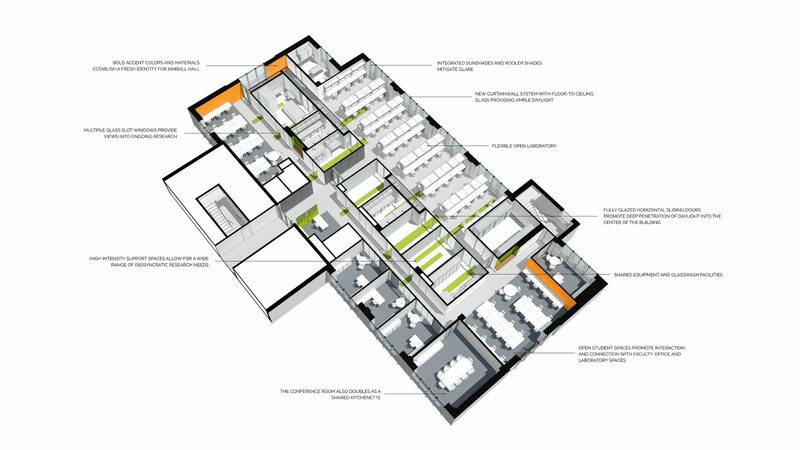 The character of the renewed spaces further enlivens the experience. 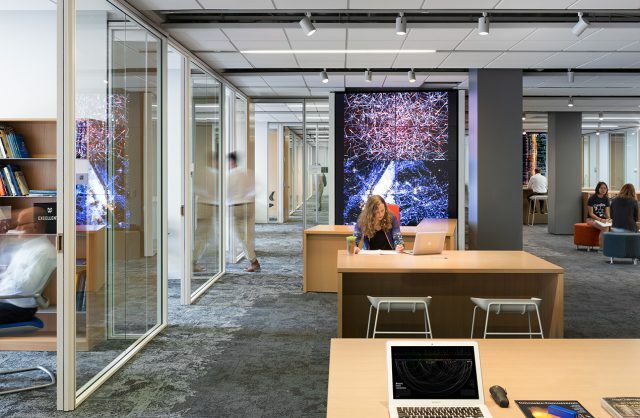 Daylight floods the building’s bright interiors, streaming through expanded windows. 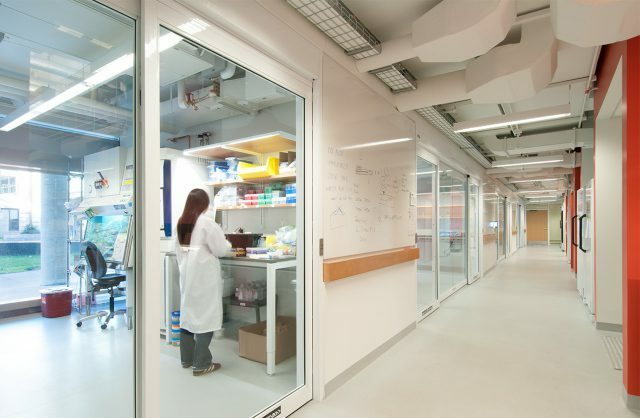 Sliding glass doors and slot windows carry the sense of openness and transparency into the support zone. 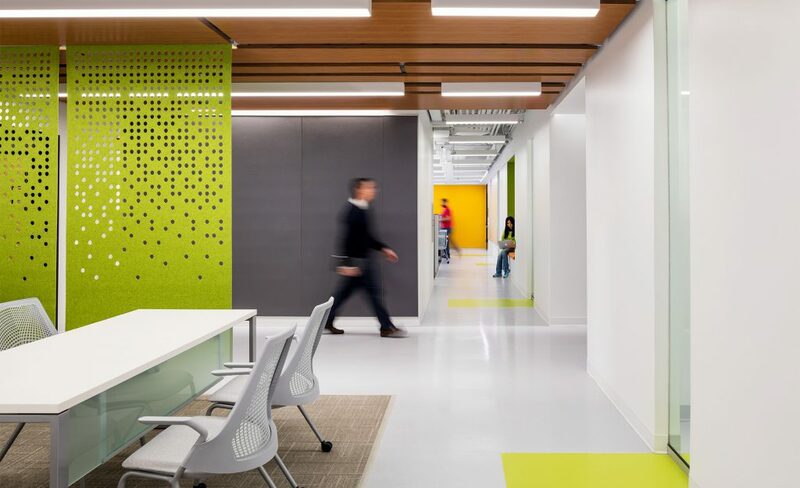 Bold materials and accent colors introduce a playful energy.